Studio Line: Warner Bros. - Some pets deserve a little more respect than others. Si-i-i-t. Sta-a-a-a-a-y. Laugh! 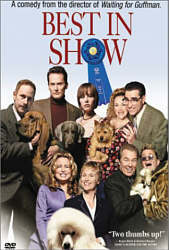 Best In Show is "the year's funniest movie." (Lou Lumenick, New York Post). Waiting For Guffman's Christopher Guest directs and many of the film's stars (including Fred Willard as a loopy commentator) reunite for this zany look at dog show participants (and the pooches who love them). Join the fun as Mayflower Kennel Club competitors - a fly-fishing shop owner from Pine Nut, NC (Guest), Shih-Tzu-doting partners (Michael McKean and Jon Michael Higgins), squabbling yuppies (Parker Posey and Michael Hitchcock), a dim-bulb trophy wife (Jennifer Coolidge) and her ace handler (Jane Lynch) and a married couple (Eugene Levy and Catherine O'Hara) who dream up ditties about terriers - vie for the top prize. It's howlarious! Box Office: Budget: $6 million. Opening Weekend: $413,436 (13 screens). Gross: $18.621 million. DVD: Widescreen 1.85:1/16x9; audio English Dolby Digital 5.1, French Dolby Digital 5.1; subtitles English, French; closed-captioned; single sided - double layered; 35 chapters; rated PG-13; 90 min. ; $24.98; street date 5/15/01. Supplements: Audio commentary from Writer/Director/Actor Christopher Guest and Writer/Actor Eugene Levy; Deleted Scenes With Audio Commentary; Theatrical Trailer; Cast and Crew Filmographies. For almost nine years, I’ve been the proud owner of a wonderful toy poodle named Oat. She leads a pretty cushy little life, and periodically I feel compelled to remind her how good she has things. Usually this occurs during some form of major storm, as I like to point out to her that many poor dogs are stuck out in the elements while she snoozes on her nice warm chair. However, other events prompt my harangues as well. 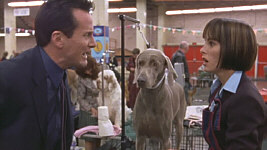 Such a diatribe occurred as I watched Best In Show, a faux documentary about the world of big-time dog shows. 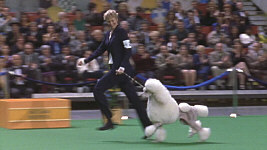 Oat’s a purebred poodle, and had I wanted to do so, I could have entered her into a life such as this. However, I wanted her to live a normal life, so I avoided the circuit, a decision for which she should thank me. Of course, BIS doesn’t purport to offer a perfectly factual look at the world of the dog show, but despite its satirical edge, I think it comes closer than many real-life participants might like to admit. In this terrific comedy, we focus upon a small group of competitors and their dogs. However, the humans are emphasized in this production, as their quirks are more entertaining than anything the relatively normal dogs could do. Among the main participants in BIS are Harlan Pepper (writer/director Christopher Guest) and his bloodhound Hubert, the owner of a fishing store in North Carolina. 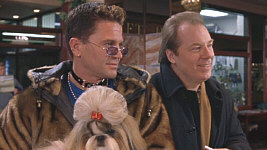 Stefan Vanderhoof (Michael McKean) and Scott Donlan (John Michael Higgins) are a gay couple from New York who bring their shih tzu plus enough clothes and furnishings to make their two-night stay in Philadelphia last a month, while uptight, neurotic yuppie couple Meg (Parker Posey) and Hamilton (Michael Hitchcock) Swan take their Weimaraner Beatrice and her favorite toy Busy Bee to the big show. As was the case in the seminal project of this kind, 1984’s classic This Is Spinal Tap, BIS uses the framework of an event mainly as an excuse to offer a running slew of character gags. Not coincidentally, Guest was one of the main participants in Tap, and a number of other performers from that flick crop up here; McKean’s the most significant member of Tap, but we also see Ed Begley Jr. and Fred Willard. Tap remains easily the superior film; it was a more inspired piece, and though it lacked a formal plot, the slow disintegration of the band as seen through the estrangement of friends Nigel Tufnel and David St. Hubbins added a connecting theme to the flick. BIS doesn’t really have any sort of unifying tone to bring all of the parts together, and it’s a much less focused film. That’s not a criticism, as it’d be nearly impossible to duplicate the brilliance of Tap; BIS is more concerned with simple humor and it lacks the sweet pathos of the older movie. In any case, BIS succeeds quite well as a comedy, almost totally because of the excellent performances seen throughout the movie. As was the case with Tap, the film may list screenwriters, but the entire cast actually wrote the picture. Guest and Levy created a basic storyline to follow and included specific incidents that they wanted to occur along the way, but each actor was responsible for the actual exposition and execution of those moments. The film was mainly improvised, and wonderfully so. Comedy is a performer’s medium anyway, but this format really ups the ante, and all of the actors respond terrifically to the challenge. It’d be virtually impossible to single out any particularly special performances, though Willard does almost steal the second half of the film with his exuberantly moronic work as show commentator Buck Laughlin. Although Willard clearly makes Laughlin seem like an idiot, he does so with the same endearing qualities that accompany almost all of the characters. All of the roles dangerously approach the status of caricatures, but the actors usually imbue them with enough gusto and charm to make them come across as affectionate portrayals. While we like to laugh at the characters, for the most part we like them and don’t feel as thought we’re disconnected with them. Granted, that’s not a perfect rule, and I thought some of the roles lacked enough empathy. Cummings and Cabot weren’t unlikable, but we rooted against them, and the Swans are absolutely despicable. They’re two loathsome characters who attack everything they touch except for their ridiculously-coddled dog, and while they were hilarious to watch - Posey and Hitchcock contribute terrific performances - I thought they should have provided something more warm onto which we could latch. No, comedies don’t have to be fully filled with fuzzy roles, but a spoof such as this works best when we care about the characters to some degree, and a few of these main participants weren’t very endearing. I have to give special credit to Guest for his work as North Carolinian Pepper for one reason. Normally when we hear a southern accent in a film, it tends to be excessively heavy and the actor comes across as a reject from Hee Haw. That was most definitely not the case with Guest, as he dons a perfect tone that seemed eminently believable. He made Pepper’s lines a bit tough to understand at times, but this was appropriate, and he did it without any of the usual Blanche DuBois dramatics. It’s just one of a slew of nice performances that populate Best In Show, a consistently funny spoof of dog shows and the over-the-top personalities they attract. Though not in the class of something such as This Is Spinal Tap, the film was quite well-executed and entertaining, as it provided 90 minutes of almost non-stop humor. This is the kind of movie that will likely endure repeated viewings, and I’m glad to have it in my collection. 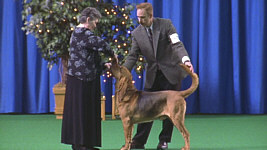 Best In Show appears in an aspect ratio of approximately 1.85:1 on this single-sided, dual-layered DVD; the image has been enhanced for 16X9 televisions. As a low-budget film, BIS had some flaws inherent to the original product, and while these meant that the movie didn’t look terrific, I thought the DVD replicated the material well. Sharpness usually appeared acceptably accurate and detailed. At times, however, I found the image to come across as somewhat fuzzy and soft, with lesser definition seen in some of the wide shots. Nonetheless, most of the movie appeared clear and appropriately focused. Moiré effects and jagged edges presented no concerns, but print flaws were a more substantial issue. I saw periodic examples of white speckles during the film, and grain was a constant companion. The latter shouldn’t be seen as a problem exclusive to this DVD, as the theatrical prints looked tremendously grainy as well. Because I slave over so many DVDs, I don’t get out to many movies any more, but I did see BIS last fall, and I definitely noticed how intensely grainy the film appeared. Actually, compared to the way it looked on the big screen, this DVD seemed to display less heavy grain, but it was nonetheless a noticeable presence throughout the movie. Colors were fairly accurate, though they seemed to be a little murky at times. The film stock used didn’t resolve the hues terribly well, so while they generally appeared acceptably vivid and bright, they lacked tremendous tightness. Black levels were fairly deep and rich, and shadow detail seemed good, though there really weren’t a whole lot of low-light sequences to test the movie. Ultimately, most of the flaws found in Best of Show resulted from the budget and the film stock, and I thought the DVD provided a solid presentation of the original material. While Best In Show offers a Dolby Digital 5.1 soundtrack, don’t get your hopes up that you’ll hear some spectacular audio. The soundfield broadened sufficiently so that it wasn’t just “glorified mono”, but the image remained pretty heavily focused in the center channel nonetheless. The film featured no score, so the only audio heard outside of the middle speaker came from a variety of ambient effects. In that regard, the mix did pretty well for itself. I heard nice atmospherics from the side speakers throughout the movie, and the surrounds kicked in adequately during appropriate scenes. For example, a thunderstorm added a modest punch from all five channels, and the crowd noise during the show itself seemed appropriately engulfing, though it remained fairly modest. Audio quality sounded very good. Dialogue appeared consistently warm and natural, and speech displayed no concerns related to edginess or intelligibility. Since spoken language strongly dominated the soundtrack, that was extremely important; without clear dialogue, the DVD’s audio would have been a disaster. Effects were a minor component of the mix, and they seemed appropriately subdued and accurate; there wasn’t much to hear, but the various elements appeared clean and distinct. Music was almost totally a non-factor during the film. Some music introduced the TV show for which Fred Willard’s character commented, and there was also a song that played over the end credits and a couple of other tunes that fit in with the action. However, the lack of a true score meant that music remained an extremely minor factor during this mix. Ultimately, the soundtrack to Best In Show sounded clear and it worked appropriately well for the material, all of which added up to a solid “B” rating. Although Best In Show isn’t a packed special edition, the DVD provides a decent mix of nice extras. 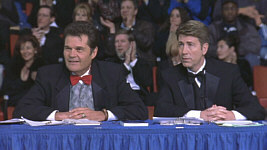 First up is a running audio commentary from director/writer/actor Christopher Guest and writer/actor Eugene Levy. I found this to be a somewhat spotty but moderately enjoyable piece. I’m a big fan of both men, and it was especially nice to hear from Levy, who I’ve respected for decades through his work on SCTV. Both contribute occasional nuggets of information here, and we get a decent look at the process used to make the film, but it wasn’t exactly a scintillating piece. There are some amusing moments and I obtained a passable impression of the movie’s creation, but as a whole, it was a fairly average commentary. More fun are the Deleted Scenes. Here we find 30 minutes of unused material, and it’s almost all very good stuff. As I watched these, it became clear that they weren’t edited because of poor quality; since about 60 hours of footage was filmed for BIS, not everything could make the cut, so some excellent clips fell to the floor. These extras were a lot of fun and made for a nice complement to the film proper. The deleted scenes also can be screened along with commentary from Guest and Levy. As with their full track, this piece was a little lifeless, but it added some information about the specific reasons for the removal of the segments, and the two get in a few good jokes as well. Lastly, the DVD provides the film’s theatrical trailer and we also get Cast and Crew entries. There are listings for Guest, Levy, Catherine O’Hara, and Michael Hitchcock. Those names can be accessed to view filmographies; as is typical for Warner Bros. DVDs, there are other performers listed whose prior work is not available. “Additional Actors” gives us filmographies for Bob Balaban, Ed Begley Jr., and Fred Willard. Why aren’t they included in the regular “C&C” list? I have no idea. 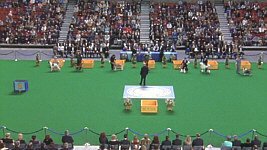 As a whole, Best In Show is a very solid DVD. The movie itself was a lot of fun, as it provided a roster of fine performances and a consistently witty and amusing experience. The DVD offered good picture and sound plus some positive extras. As with sibling This Is Spinal Tap, Best In Show should provide many repeat screenings of entertainment and I highly recommend the DVD.